Beat the competition through clarity of end-in-mind and by pushing the right strategic levers. “With vision, the people thrive”. Recreate your vision of where the company should be heading and thrive. Vision comes first; regardless of scope, whether your focus is corporate, category, brand, or an urgent turnaround, vision must come first. Business vision articulates the future state of the business that is to be achieved. Business vision is an intelligent foresight, forming a mental image of a future business that does not currently exist. A great vision must be rationally and emotionally inspiring. Doing this well requires a combination of intelligent foresight, creativity, mental rigour, and a big heart. Intelligent foresight: discernment and perception in foreseeing trends for consumers, customers, markets and the business. Creativity: the ability to create a picture of the future with multiple new components. Mental rigour: the discipline to create something stretching and breakthrough, yet achievable; this includes targeting the right financials for shareholders aligned with CEO targets. Heart: an emotionally inspiring vision will motivate people throughout the organisation. Strategy complements vision. The business strategy lays out competitive strategies for sustainable success in strategic customer segments. This includes operational strategies for category, brand, or business unit turnaround. Our experience demonstrates that a sharp strategy will guide your business towards a better future. 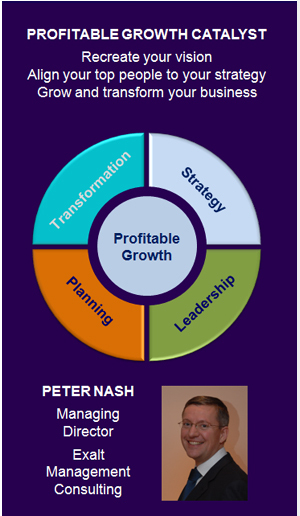 It will help you grow business value by pulling the right key value levers.